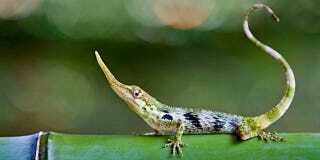 Check out Anolis proboscis, also known as the Pinocchio lizard, for obvious reasons. This animal hadn't been seen from the 1960s through to 2005. Now, a team of photographers has finally caught up with the elusive reptile, capturing these remarkable images. All photos: Alejandro Arteaga & Lucas Bustamante / Tropical Herping. Also known as the Pinocchio anole — an anole being a type of lizard — it was first discovered in 1953 by an ornithologist working in a remote area of northwest Ecuador. It promptly disappeared from human eyes until 2005, but after a three-year search by Tropical Herping's Alejandro Arteaga in the same region, the long-nosed animal was seen again.